I love this story about an immigrant teenager who’s having a tough time fitting in. Her story is simple; not unique at all as there are countless other teens around the world that go through this. A common story brought to life through drawing and humor. Then she falls into a well and that is where her ho-hum story stops being common. In the well, she meets the ghost of a young teen that ended up down there many years ago. Anya, our teenager, is embarrassed about her Russian ancestry and tries hard so hard to not identify with it. She’s self-conscious about her body and is resigned to never feeling like she belongs… so, she’s a normal teen. 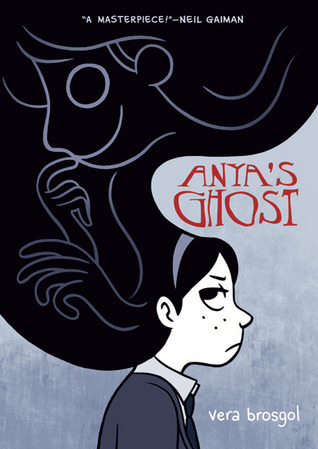 Emily, Anya’s ghost, met an unfortunate end years ago and it appears she cannot move on. Maybe she didn’t see the light or was advised to stay away from it, so she’s still hanging around. After Anya is rescued she realizes that Emily is tagging along and Anya is not too happy about it. Just look at Anya’s face on the cover – not happy 🙁 She eventually warms up to her and that’s where their friendship and the fun begins. Lately, I’ve been reading a lot more graphic novels than I usually do and they all vary in styles, but I’m still new to this genre and don’t consider myself an expert or connoisseur. What I do know is what I find pleasing to my eyes and what I like. And this graphic novel ticks both the pleasing and liked boxes. The artwork is simple and drawn predominantly in hues of violet. Good thing I checked wikipedia because I was going to say it was drawn in gray tones. At least that what they looked like in the library book. I described the artwork as simple but it’s beautifully illustrated and very expressive. I hope I’m making sense here. There are consecutive pages with no dialogue and the story doesn’t skip a beat. There’s also an important not-so-subtle message there that I hope isn’t dismissed. I’ll be picking up a hardcover copy for my library. I highly recommend this spooky little story. I used to have dreams about being a ‘housekeeper’ to a Frankenstein’s monster-like character at the bottom of a well… quite creepy and totally odd… anyway, the blurb reminded me of that dream.